For most parts of North America, on Sunday at 2 AM in the morning on 2016-03-13 DST (Daylight Saving Time) ends. You should change all your clocks forward one hour from 2:00 AM to 3:00 AM. Computer clocks will change themselves. If they don’t, you can use SetClock to prod them along. You will get an hour’s less sleep. Don’t set the computer clock manually to adjust for DST end! Manually adjust your wrist watch, wall clocks, alarm clocks, microwave, stove, VCR (Videocassette Recorder)… Radio-Synched clocks watches and timers should adjust themselves. If you launch SetClock, now, (or later) it will set your PC (Personal Computer) clock to the accurate current time from an atomic clock on the web permitting Windows to automatically set your PC’s clock forward one hour at the precise instant. Click the orange launch button to run SetClock. Then click Get Time, then Set Time, then Exit. SetClock is a Java Web Start program that sets your PC clock accurately by probing an atomic clock on the web. The atomic clock knows the precise UTC time, including leap seconds. If you are running Vista, W2008, W7-32, W7-64, W8-32, W8-64, W2012, W10-32 and W10-64, then you must be running as an administrator or the SetClock program will be able to display the time, but will not be able to set it. SetClock is also available with Java source to download. SetClock is not necessary for Vista, W2008, W7-32, W7-64, W8-32, W8-64, W2012, W10-32 and W10-64, which has its own atomic clock setting procedure, though you can use SetClock if you want, or if you suspect your OS (Operating System) is not maintaining your clock’s accuracy. You will get the most accurate results if you don’t have a lot of Internet activity running at the same time. For SetClock to work, your PC clock must be configured to the correct time zone and automatic daylight saving must be on. You can veryify they are set properly by left clicking the time in the bottom right corner of the screen ⇒ clicking change date and time settings ⇒ Clicking change time zone. The clock inside your computer runs on UTC/GMT time, independent of your time zone or whether daylight saving is in effect. You must not manually adjust it for daylight saving changes. Your computer software will automatically change the displayed time to account for daylight saving so long as you have configured the correct time zone in the control panel. In any case, SetClock will undo the damage caused by someone fiddling with your computer’s clock. For this Java Web Start to work, you must click grant/accept/always run on this site/I accept the risk to give it permission to set your PC’s hardware clock. If you refuse to grant permission, the program may crash with an inscrutable stack dump on the console complaining about AccessController.checkPermission. This signed Java Web Start application requires modules from the Microsoft C++ Express 10 run time library. Normally they should be automatically statically included. However, if someone recompiled the JNI C++ code without the /MT option, this code will not work unless the vcredist_x86.exe Microsoft C++ Express 10 run time library is preinstalled. You can download it from Microsoft. The symptom of this problem is an UnsatisfiedLinkError or a side-by-side configuration error. Be sure to get the 2010 version. The older versions have the same name. Unfortunately SetClock only works for Windows computers since it has to use a small piece of JNI (Java Native Interface) native code to actually set the system clock. If you are willing to port the tiny piece of JNI code to your platform, I would be happy to incorporate it so that SetClock works on your platform too. Click the dark blue WebStart button at the top of the page to run the Setclock program. for the current version of SetClock. 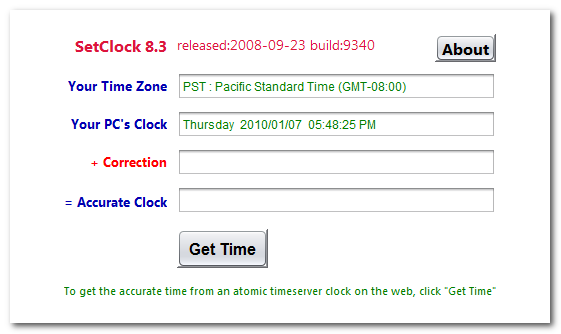 Set your PC Clock from an accurate atomic webserver clocks. 797K zip for SetClock Java source, compiled class files, jar and documentation to run on your own machine as a Java Web Start application. access setclock source in repository with [Tortoise] Subversion client on wush.net/svn/mindprod/com/mindprod/setclock/. download ASP PAD XML program description for the current version of SetClock. SetClock is free. Full source included. You may even include the source code, modified or unmodified in free/commercial open source/proprietary programs that you write and distribute. Non-military use only.